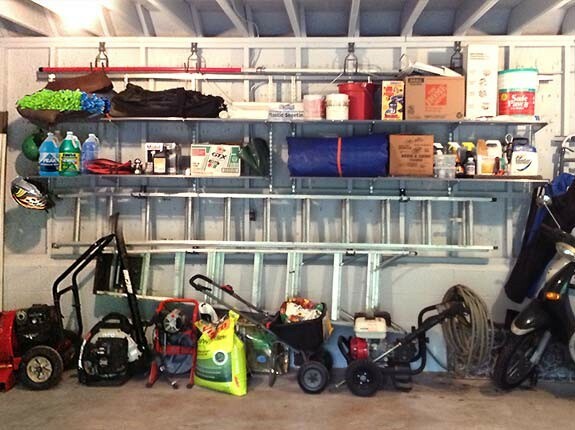 We would like to present this detailed case study as an example of our garage organizing process. 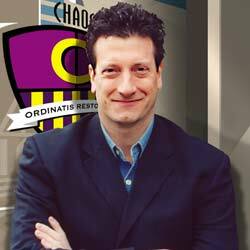 Of course, every client has different needs, and each project is uniquely created to match the goals and budget for each client. The climate – is there high humidity, or will extreme cold or heat have an effect on the space? 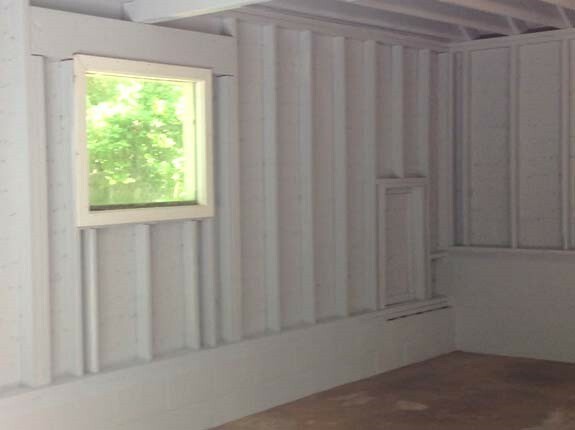 The structure - are the walls "finished", or are there exposed studs and structural beams? If there are walls, what are they made of? This particular detached garage in Weston, CT was situated on a very wet patch of property in the woods, so its structure and surrounding climate ended up playing a major role in how we would approach the project. The walls and ceiling were unfinished, with exposed wood beams throughout. We then assessed the level of moisture in the space – an important factor in determining the sort of organizing materials we would use to equip the garage. Moisture contributes to mold, and attracts all sorts of insects. 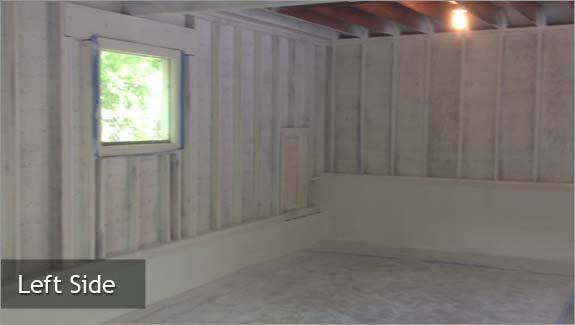 Moisture and dampness can also affect the structural integrity of the space, especially where sheet rock is concerned. 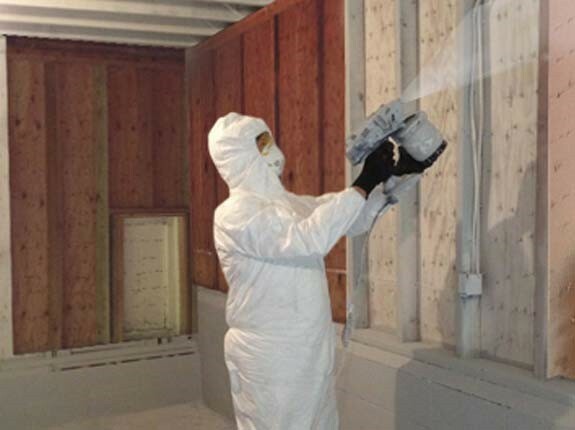 Sheet rock is highly porous, and moisture often begins seeping into the product from the floor up – forming mold, and then eroding the walls' materials. Finishing these walls in sheet rock wouldn’t be practical, as finished walls would present well at first, but deteriorate over time. Also, the base of the walls was constructed out of cinderblock - a highly porous material. We determined that high-quality paint, rated for exterior use and applied with a power sprayer, would produce an equally appealing finished look. But first we needed to start with a clean palette. tear out the existing wood shelving and cabinetry, which due to the moisture and years of seasonal weather changes, had outlived its usefulness. 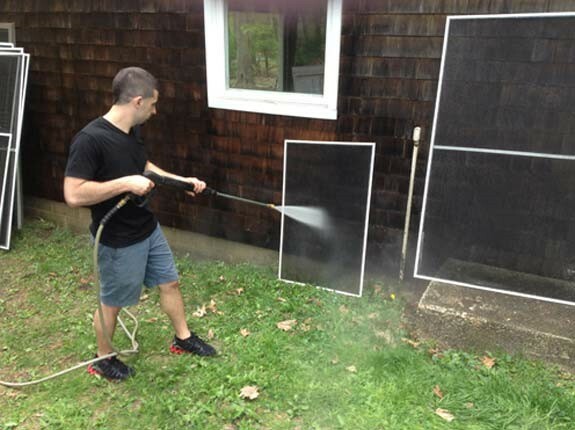 We thoroughly cleaned power washed the entire space, including the walls, ceiling, floor, windows and screens, which also helped eliminate the spider-webs that had formed in several locations. A storage "attic "space existed above the ceiling, which contained important items that did not fit in the house, so we carefully wrapped these contents in tarps. 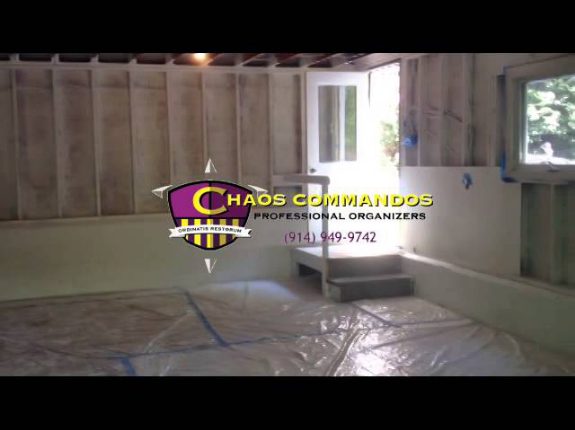 Since gaps existed where support beams met the floor, we sealed them with tightly rolled strips of plastic sheeting to keep the water out, and the contents dry. 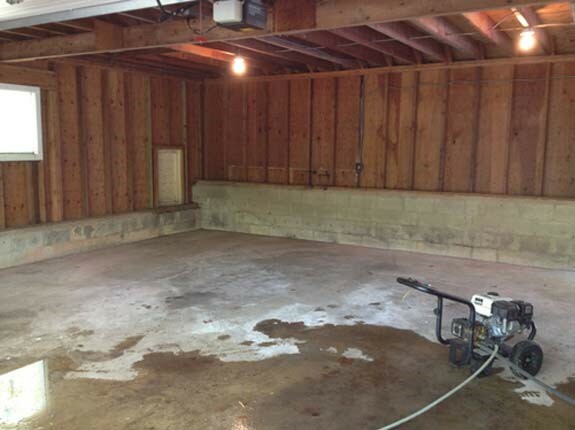 After the power washing process was complete, we hand sprayed a non-– toxic mold remediation product on every surface from the floor to the rafters. 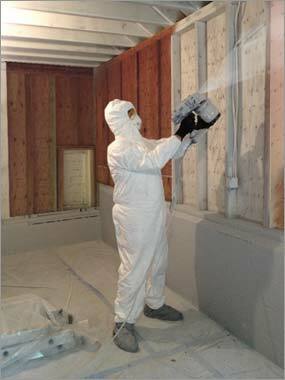 This killed the existing mold, and would prevent mold from forming in the future. We ran a 50 foot garden hose from the outside of the house to the garage and power washed the gardening tools, mower, and the afore-mentioned screens. 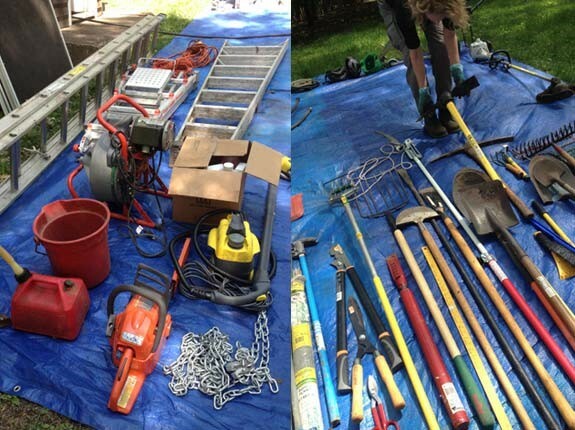 Other tools like hedge trimmers and weed-whackers, which contained motors and moving parts, were carefully cleaned by hand. 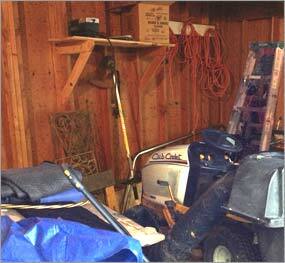 By laying the tools on tarps, we could also take inventory, and plan their organization accordingly. It was now time to paint. In order to provide even coverage and properly seal all surfaces, we started by painting with a high- quality primer. Wood, especially in exterior environments like sheds, garages and barns, gets very "thirsty" and will absorb more paint than normal. Since the studs, and support beams had to be painted thoroughly on all surfaces, a traditional paint roller would've been inefficient. Therefore we chose a power sprayer with an extension "arm" assuring proper coverage, especially on the higher surfaces of the ceiling. 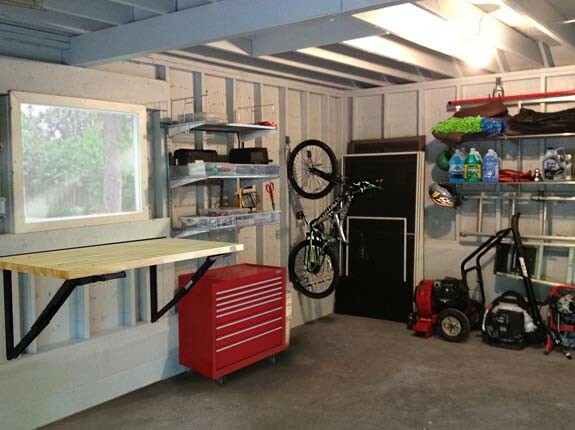 We then maximized our time at the garage to accomplish other tasks while the product fully dried. With the primer dry, we then moved onto the painting of the topcoat itself. We chose a shade of gray, which would have a clean appearance and would hide dark spots and surface dirt that might develop over time. For the cinderblock walls, we used a mold preventing combination of primer, paint and sealer – an excellent solution for porous materials. 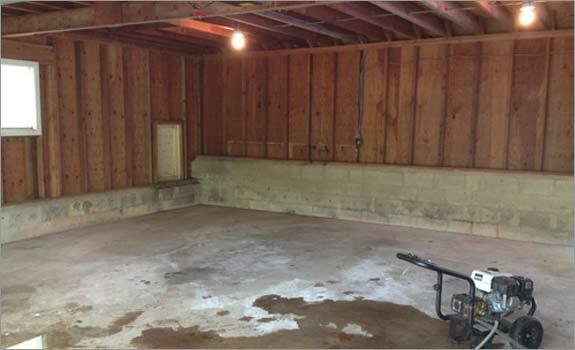 Below is the finished garage after we painted it. 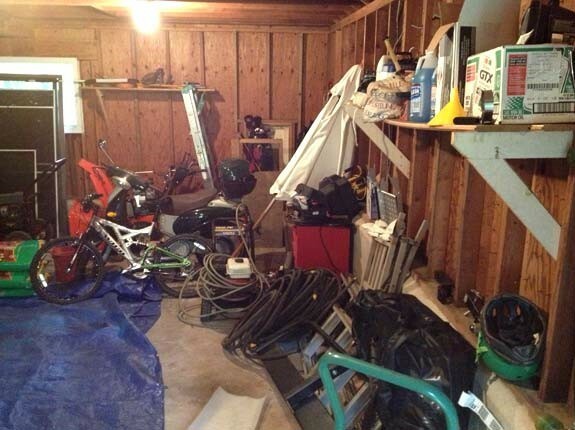 Please move your mouse over the image, and you will see the left and right side of the clients garage. 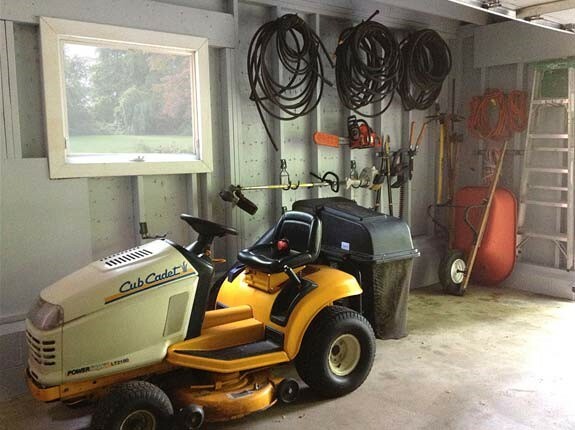 The client's garage needed to accommodate all sorts of seasonal equipment and power tools, a riding mower and a heavy duty snowplow in addition to their cars, so we designed the space to allow for the these items to navigate in and out of the garage easily. We chose shelving and installation materials that were tough enough for all sorts of storage needs and would perform well over time. Steel ventilated shelving was the perfect choice for this client. It allows air to circulate on all sides, and prevents mold and mildew. 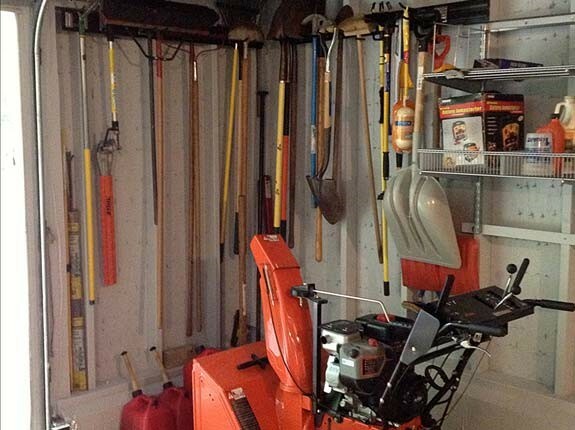 This is a very important feature for a garage like this. We anchored the shelves’ support posts to the exposed studs, using wood strips painted in a matching gray, then fastened everything horizontally along the beams for a secure fit. Tools were hung on custom hooks, and attached to the walls in easy to reach positions throughout the space. 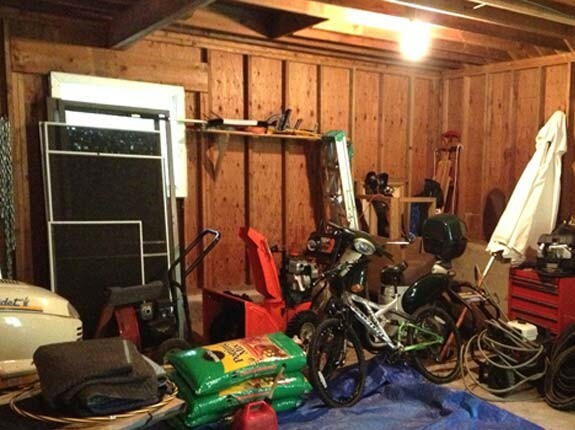 Here is a before and after picture of the client's garage work area. 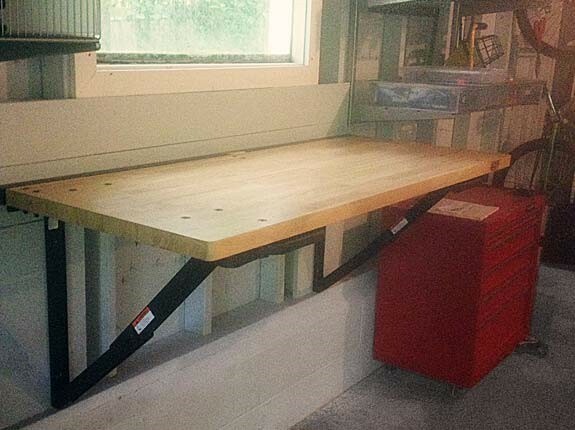 Since the client often worked on house-related projects and repairs, he also needed a high-quality workbench, but one that could be collapsed when not in use. We were put in charge of finding the perfect product, and then given the opportunity to install it. The job required that we cut shorter sections of two-by-four for the workbench to be attached to, thereby creating not only a secure, but a level surface for him to work on. We installed the workbench to a designated wall under a window, where daylight streamed in, assuring that our client had the optimal space to work in. 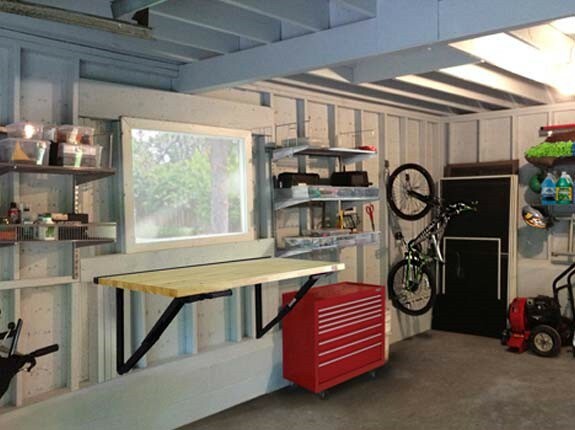 The workbench can be positioned in an up or down position providing the client more flexibility with the space. 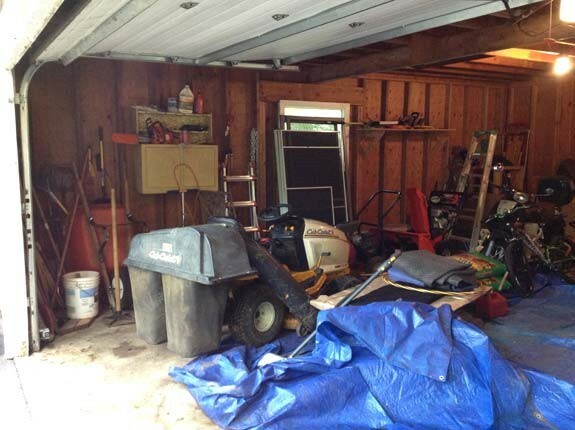 All in all, this garage presented some very interesting challenges, that produced some dramatic results. 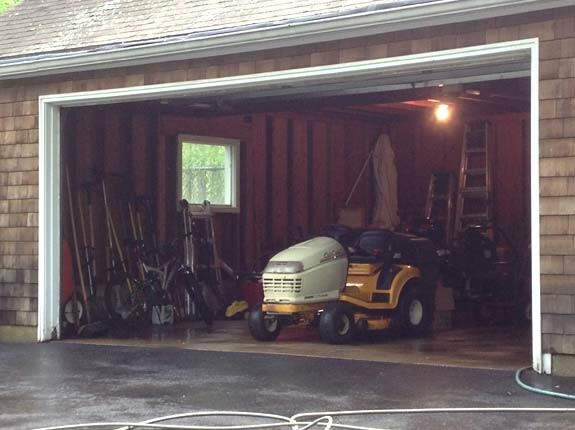 The client was thrilled to have a "fully operational" garage, as he called it, and we took great pride in making it happen. 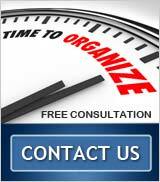 Please contact us to learn how we can organize your home or business.